The Buddhist doctrine of the two truths (Wylie: bden pa gnyis ) differentiates between two levels of satya (Sanskrit), meaning truth or "really existing" in the discourse of the Budhha: the "conventional" or "provisional" (saṁvṛti) truth, and the "ultimate" (paramārtha) truth. The exact meaning varies between the various Buddhist schools and traditions. The best known interpretation is from the Madhyamaka school of Mahāyāna Buddhism, whose founder Nagarjuna, originally propounded the doctrine. The phenomenal world is accorded a provisional existence. The character of the phenomenal world is declared to be neither real nor unreal, but logically indeterminable. The ultimate truth, on the other hand, is posited as elusive to ordinary experience and conceptual thought. Nagarjuna makes a significant use of the earlier Buddhist doctrine of dependent origination (pratītyasamutpāda) to prove the 'emptiness' or 'voidness' of everything, leading to the famous doctrine of 'emptiness', Śūnyatā. The Madhyamaka position concludes that everything is devoid of its own nature, everything is empty. In Chinese Buddhism, the Madhyamaka position is accepted and the two truths refer to two ontological truths. Reality exists of two levels, a relative level and an absolute level. Based on their understanding of the Mahayana Mahaparinirvana Sutra, the Chinese supposed that the teaching of the Buddha-nature was, as stated by that sutra, the final Buddhist teaching, and that there is an essential truth above sunyata and the two truths. The śūnyatā doctrine is an attempt to show that it is neither proper nor strictly justifiable to regard any metaphysical system as absolutely valid. It doesn't lead to nihilism but strikes a middle course between excessive naivete and excessive scepticism. Satya is usually taken to mean "truth", but does also refer to mean "a reality," "a genuinely real existent." "Satya" (Sat-yá) is derived from Sat and ya. Sat means being, reality, and is the present participle of the root as "to be" (PIE *h₁es-; cognate to English is). Ya and yam means "advancing, supporting, hold up, sustain, one that moves". As a composite word, Satya and Satyam imply that "which supports, sustains and advances reality, being"; it literally means, "that which is true, actual, real, genuine, trustworthy, valid". Ultimate truth (Sanskrit, paramārtha-satya, Pāli paramattha sacca, Tibetan: don-dam bden-pa), which describes the ultimate reality as sunyata, empty of concrete and inherent characteristics. worldly behavior or speech behavior involving designation and designatum, cognition and cognitum. The conventional truth may be interpreted as "obscurative truth" or "that which obscures the true nature" as a result. It is constituted by the appearances of mistaken awareness. Conventional truth would be the appearance that includes a duality of apprehender and apprehended, and objects perceived within that. Ultimate truths, are phenomena free from the duality of apprehender and apprehended. Buddha's teaching of (dharma) may be viewed as a path (mārga) of release from the anxieties of life. The first Noble Truth equates life-experiences with pain and suffering. Buddha's language was simple and colloquial. Naturally, various statements of Buddha at times appear contradictory to each other. Later Buddhist teachers were faced with the problem of resolving these contradictions. Nagarjuna and other teachers introduced an exegetical technique level-distinction between two levels of truth, the conventional and the ultimate. A similar method is reflected in the Brahmanical exegesis of the Vedic scriptuires which combine the ritualistic injunctions of the Brahmana and speculative philosophical questions of the Upanishads as one whole 'revealed' body of work thereby contrasting the jñāna kāņḍa with karmakāņḍa. 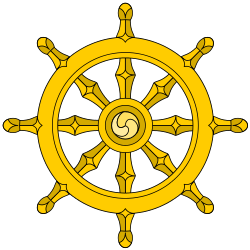 While the concept of the two truths is associated with the Madhyamaka school, its history goes back to the oldest Buddhism. In the Pali canon, the distinction is not made between a lower truth and a higher truth, but rather between two kinds of expressions of the same truth, which must be interpreted differently. Thus a phrase or passage, or a whole sutta, might be classed as neyyattha or samuti or vohāra, but it is not regarded at this stage as expressing or conveying a different level of truth. There are these two who misrepresent the Tathagata. Which two? He who represents a Sutta of indirect meaning as a Sutta of direct meaning and he who represents a Sutta of direct meaning as a Sutta of indirect meaning. Saṃmuti or samuti (Pāli; Sanskrit: saṃvṛti, meaning "common consent, general opinion, convention", and paramattha (Pāli; Sanskrit: paramārtha), meaning "ultimate", are used to distinguish conventional or common-sense language, as used in metaphors or for the sake of convenience, from language used to express higher truths directly. The term vohāra (Pāli; Sanskrit: vyavahāra, "common practice, convention, custom" is also used in more or less the same sense as samuti. The Awakened One, the best of teachers, spoke of two truths, conventional and higher; no third is ascertained; a conventional statement is true because of convention and a higher statement is true as disclosing the true characteristics of events. The Prajñaptivāda school took up the distinction between the conventional and ultimate (paramārtha/saṃvṛti), and extended the concept to metaphysical-phenomenological constituents (dharmas), distinguishing those that are real (tattva) from those that are purely conceptual, i.e., ultimately nonexistent (prajnāpti). Suppose that we take a conventional entity, such as a table. We analyze it to demonstrate its emptiness, finding that there is no table apart from its parts [...] So we conclude that it is empty. But now let us analyze that emptiness […]. What do we find? Nothing at all but the table’s lack of inherent existence [...] To see the table as empty [...] is to see the table as conventional, as dependent. The Buddha's teaching of the Dharma is based on two truths: a truth of worldly convention and an ultimate truth. Those who do not understand the distinction drawn between these two truths do not understand the Buddha's profound truth. Without a foundation in the conventional truth the significance of the ultimate cannot be taught. Without understanding the significance of the ultimate, liberation is not achieved. The world-ensconced truth and the truth which is the highest sense. Do not know the profound "point" (tattva) in the teaching of the Buddha. And without having understood the highest sense one cannot understand nirvana. By and large, Kaccayana, this world is supported by a polarity, that of existence and non-existence. But when one sees the origination of the world as it actually is with right discernment, "non-existence" with reference to the world does not occur to one. When one sees the cessation of the world as it actually is with right discernment, "existence" with reference to the world does not occur to one. According to Chattopadhyaya, although Nagarjuna presents his understanding of the two truths as a clarification of the teachings of the Buddha, the two truths doctrine as such is not part of the earliest Buddhist tradition. Paramarthika (transcendental reality), also referred to as Parinispanna in Yogacara literature:The level of a storehouse of consciousness that is responsible for the appearance of the world of external objects. It is the only ultimate reality. Paratantrika (dependent or empirical reality): The level of the empirical world experienced in ordinary life. For example, the snake-seen-in-the-snake. Parikalpita (imaginary). For example, the snake-seen-in-a-dream. The Lanka is quite explicit in assuming two forms of knowledge: the one for grasping the absolute or entering into the realm of Mind-only, and the other for understanding existence in its dual aspect in which logic prevails and the Vijnanas are active. The latter is designated Discrimination (vikalpa) in the Lanka and the former transcendental wisdom or knowledge (prajna). To distinguish these two forms of knowledge is most essential in Buddhist philosophy. When Buddhism came to China from Gandhara (now Afghanistan) and India in the first/second century CE, it was initially adapted to the Chinese culture and understanding. Buddhism was exposed to Confucianist and Taoist influences. Neo-Taoist concepts were taken over in Chinese Buddhism. Concepts such as "T’i -yung" (Essence and Function) and "Li-Shih" (Noumenon and Phenomenon) were first taken over by Hua-yen Buddhism, which consequently influenced Chán deeply. The two truths doctrine was another point of confusion. Chinese thinking took this to refer to two ontological truths: reality exists of two levels, a relative level and an absolute level. Taoists at first misunderstood sunyata to be akin to the Taoist non-being. In Madhyamaka the two truths are two epistemological truths: two different ways to look at reality. Based on their understanding of the Mahayana Mahaparinirvana Sutra the Chinese supposed that the teaching of the Buddha-nature was, as stated by that sutra, the final Buddhist teaching, and that there is an essential truth above sunyata and the two truths. The Huayan school or Flower Garland is a tradition of Mahayana Buddhist philosophy that flourished in China during the Tang period. It is based on the Sanskrit Flower Garland Sutra (S. Avataṃsaka Sūtra, C. Huayan Jing) and on a lengthy Chinese interpretation of it, the Huayan Lun. The name Flower Garland is meant to suggest the crowning glory of profound understanding. The most important philosophical contributions of the Huayan school were in the area of its metaphysics. It taught the doctrine of the mutual containment and interpenetration of all phenomena, as expressed in Indra's net. One thing contains all other existing things, and all existing things contain that one thing. The teachings of Zen are expressed by a set of polarities: Buddha-nature - sunyata, absolute-relative, sudden and gradual enlightenment. The Prajnaparamita Sutras and Madhyamaka emphasized the non-duality of form and emptiness: form is emptiness, emptiness is form, as the Heart Sutra says. The idea that the ultimate reality is present in the daily world of relative reality fitted into the Chinese culture which emphasized the mundane world and society. But this does not tell how the absolute is present in the relative world. This question is answered in such schemata as the Five Ranks of Tozan and the Oxherding Pictures. The polarity of absolute and relative is also expressed as "essence-function". The absolute is essence, the relative is function. They can't be seen as separate realities, but interpenetrate each other. The distinction does not "exclude any other frameworks such as neng-so or "subject-object" constructions", though the two "are completely different from each other in terms of their way of thinking". [A] more accurate definition (and the one the Korean populace is more familiar with) is "body" and "the body's functions". The implications of "essence/function" and "body/its functions" are similar, that is, both paradigms are used to point to a nondual relationship between the two concepts. A metaphor for essence-function is "A lamp and its light", a phrase from the Platform Sutra, where Essence is lamp and Function is light. Dzogchen holds that the two truths are ultimately resolved into non-duality as a lived experience and are non-different. Pāramārthika (paramartha, absolute), the absolute level, "which is absolutely real and into which both other reality levels can be resolved". [web 4] This experience can't be sublated by any other experience. Vyāvahārika (vyavahara), or samvriti-saya (empirical or pragmatical), "our world of experience, the phenomenal world that we handle every day when we are awake". [web 4] It is the level in which both jiva (living creatures or individual souls) and Iswara are true; here, the material world is also true. Prāthibhāsika (pratibhasika, apparent reality, unreality), "reality based on imagination alone". [web 4] It is the level in which appearances are actually false, like the illusion of a snake over a rope, or a dream. [T]hat which we use as a guide in everyday life. According to the first criterion, nothing is either true or false[.] [I]nductive statements based on direct observation of phenomena may be treated as either true or false for the purpose of making everyday practical decisions. The distinction, as Conze has noted, is equivalent to the Madhyamika distinction between "Absolute truth" (paramārthasatya), "the knowledge of the real as it is without any distortion," and "Truth so-called" (saṃvṛti satya), "truth as conventionally believed in common parlance. ↑ According to Lal Mani Joshi, Bhāviveka (6th century CE), the founder of the Svātantrikasubschool of the Mādhyamaka, classified samvrti into tathya-samvrti and mithya-samvrti. Candrakīrti (7th century CE), one of the main proponents of the Prasaṅgika subschool of Madhyamaka, divided samvrti into loka-samvrti and aloka-samvrti. Shantideva (8th century CE) and his commentator Prajñakaramati (950-1030[web 2]) both use the terms tathya-samvrti and mithya-samvrti. Kumārila Bhaṭṭa, an influential 8th-century Mimamsa-philosopher, in commenting on Madhyamaka philosophy, also uses the terms loka-samvrti and aloka-samvrti. Murti, in his The Central Philosophy of Buddhism, uses the term aloka, and refers to the synonym mithya samvrti. Murti: "In calling it 'loka samvrti,' it is implied that there is some appearance which is 'aloka' - non-empirical, i.e. false for the emprical consciousness even." David Seyfort Ruegg further comments: "The samvrti in worldy usage is termed lokasamvrti; and while it can serve no real purpose to distinguish an alokasamvrti opposed to it (from the point of view of ultimate reality both are unreal, though in different degrees from the relative standpoint), one may nevertheless speak of an alokasamvrti as distinct from it when considering that there exist persons who can be described as 'not of the world' (alokah) since they have experiences which are falsified because of the fact that their sense-faculties are impaired (and which, therefore, do not belong to the general worldly consensus." ↑ An often-used explanation in Madhyamaka literature is the perception of a snake. The perception of a real snake is tathya-samvrti, concretely existing. In contrast, a rope which is mistakenly perceived as a snake is mithya-samvrti. Ultimately both are false, but "the snake-seen-in-the-rope" is less true than the "snake-seen-in-the-snake." This gives an epitemological hierarchy in which tathya-samvrti stands above mithya-samvrti. [web 1][web 3] Another example given in Madhyamaka literature to distinguish between tathya-samvrti and mithya-samvrti is "water-seen-in-the-pool" (loka samvriti) as contrasted with "water-seen-in-the-mirage" (aloka samvriti). ↑ Mithya-samvrti or "false samvrti" cam also be given as asatya, "untruth. "[web 1] Compare Peter Harvey, noting that in Chandogya Upanishad 6.15.3 Brahman is satya, and Richard Gombrich, commenting on the Upanishadic identity of microcosm and macrocosm, c.q. Atman and Brahman, which according to the Buddha is asat, "something that does not exist." Compare also Atiśa: "One may wonder, "From where did all this come in the first place, and to where does it depart now?" Once examined in this way, [one sees that] it neither comes from anywhere nor departs to anywhere. All inner and outer phenomena are just like that." ↑ Some have interpreted paramarthika satya or "ultimate truth" as constituting a metaphysical 'Absolute' or noumenon, an "ineffable ultimate that transcends the capacities of discursive reason." For example T.R.V. Murti (1955), The Central Philosophy of Buddhism, who gave a Neo-Kantian interpretation. ↑ "Primordial wisdom" is a rendering of jñāna and "that which surpasses intellectual knowledge" may be understood as the direct perception (Sanskrit: pratyakṣa) of(dharmatā). "Conviction" may be understood as a gloss of faith (śraddhā). An effective analogue for "union", a rendering of the relationship held by the two truths, is interpenetration. "The learned and accomplished masters of the Old Translation school take as their stainless view the freedom from all conceptual constructs of the four extremes, the ultimate reality of the two truths inseparably united." ↑ Kumārila Bhaṭṭa: "The idealist talks of some 'apparent truth' or 'provisional truth of practical life', i.e. in his terminology, of samvriti satya. However, since in his own view, there is really no truth in this 'apparent truth', what is the sense of asking us to look at it as some special brand of truth as it were? If there is truth in it, why call it false at all? And, if it is really false, why call it a kind of truth? Truth and falsehood, being mutually exclusive, there cannot be any factor called 'truth' as belonging in common to both--no more than there can by any common factor called 'treeness' belonging to both the tree and the lion, which are mutually exclusive. On the idealist's own assumption, this 'apparent truth' is nothing but a synonym for the 'false'. Why, then, does he use this expression? Because it serves for him a very important purpose. It is the purpose of a verbal hoax. It means falsity, though with such a pedantic air about it as to suggest something apparently different, as it were. This is in fact a well known trick. Thus, to create a pedantic air, one can use the word vaktrasava [literally mouth-wine] instead of the simpler word lala , meaning saliva [vancanartha upanyaso lala-vaktrasavadivat]. But why is this pedantic air? Why, instead of simply talking of falsity, is the verbal hoax of an 'apparent truth' or samvriti? The purpose of conceiving this samvriti is only to conceal the absurdity of the theory of the nothingness of the objective world, so that it can somehow be explained why things are imagined as actually existing when they are not so. Instead of playing such verbal tricks, therefore, one should speak honestly. This means: one should admit that what does not exist, exists not; and what does exist, exists in the full sense. The latter alone is true, and the former false. But the idealist just cannot afford to do this. He is obliged instead to talk of 'two truths', senseless though this be." 1 2 3 4 5 6 7 Matilal 2002, pp. 203-208. 1 2 Lai 2003, p. 11. ↑ Harvey 2012, p. 50. ↑ Levinson, Jules (August 2006) Lotsawa Times Volume II Archived July 24, 2008, at the Wayback Machine. 1 2 Garfield 2002, p. 91. 1 2 3 4 Chattopadhyaya 2001. 1 2 3 Joshi 1977, p. 174. 1 2 Nakamura 1980, p. 285. 1 2 3 Dutt 1930. 1 2 3 4 Stcherbatsky 1989, p. 54. ↑ Murti 2013, p. 245. ↑ Mrti 2013, p. 245. ↑ Seyfort Ruegg 1981, p. 74-75. ↑ Gombrich 1990, p. 15. ↑ Brunholzl 2004, p. 295. 1 2 Garfield 2002, p. 38–39. 1 2 3 4 Siderits 2003. ↑ Westerhoff 2009, p. 9. ↑ Mūlamadhyamakakārikā Verse 24 Archived February 8, 2005, at the Wayback Machine. ↑ Source: Kaccāyanagotta Sutta on Access to Insight (accessed: January 2, 2008) Archived May 11, 2006, at the Wayback Machine. ↑ Chattopadhyaya 2001, p. 21-3,94,104. ↑ S.R. Bhatt & Anu Meherotra (1967). Buddhist Epistemology. p. 7. ↑ Debiprasad Chattopadhyaya (2001). What is Living and What is Dead in Indian Philosophy 5th edition. p. 107. ↑ Goddard 2007, p. 10. ↑ Verstappen 2004, p. 5. ↑ Fowler 2005, p. 79. ↑ Dumoulin 2005a, p. 45-49. ↑ Lai 2003, p. 8. ↑ Debiprasad Chattopadhyaya (2001). What is Living and What is Dead in Indian Philosophy 5th edition. pp. 107, 104. 1 2 3 Debiprasad Chattopadhyaya (2001). What is Living and What is Dead in Indian Philosophy 5th edition. pp. 370–1. ↑ Sheridan 1995, p. 198-201. ↑ Sharma 1980, p. 5-6. Conze, Edward (1959). Buddhism: Its Essence and Development. New York, US: Harper and Row. Joshi, Lal Mani (1977), Studies in the Buddhistic Culture of India During the Seventh and Eighth Centuries A.D., Motilal Banarsidass Publ. Matilal, Bimal Krishna (2002). Ganeri, Jonardon, ed. The Collected Essays of Bimal Krishna Matilal,Volume 1. New Delhi: Oxford University Press (2015 Reprint). ISBN 0-19-946094-9. Lopez, Donald S., "A Study of Svatantrika", Snow Lion Publications, 1987, pp. 192–217. Murti, T R V (2013). The Central Philosophy of Buddhism: A Study of the Madhyamika System. Routledge. ISBN 1-135-02946-6. Nakamure, Hajime (1980), Indian Buddhism: A Survey with Bibliographical Notes, Motilal Banarsidass Publ. Stcherbatsky, Theodore (1989), Madhyamakakārikā, Motilal Banarsidass Publ. Barbara O'Brien: The Two Truths. What Is Reality?